HELLO & THANK YOU ALL YOU 2009 RAFTERS! Thanks so much for taking part on Saturday in the worst conditions imaginable! 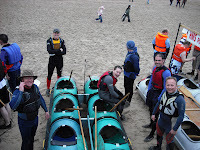 We had 83 rafts which has been one of our best entry fields so far in the history of the event! Results and updates are being prepared at the minute to go on our main page. 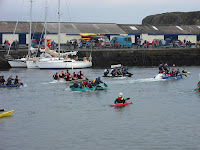 The Raft Race Committee and the crew of Portrush Lifeboat Station would like to sincerely thank you and your supporters for turning out on Saturday. Our provisional total stands at £25k so far and we are still waiting on money to come in! Many thanks to SPAR retail our sponsors, Coleraine Borough Council,all the people who manned the Spring Stalls, Longmountain Gallery for the art exhibition and our friends in the Press who are always so supportive. Thanks again everyone and remember next years race will be on Saturday 29th May 2010! !